Advertising Medium- Glass Mirror Branding @ Food Court, Elante Mall, Chandigarh. 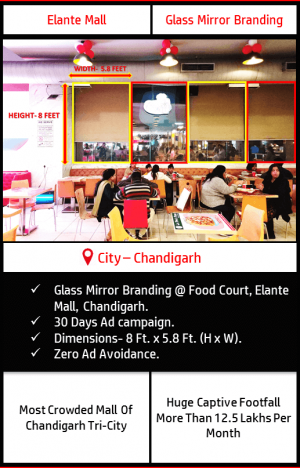 Why Glass Mirror @Food Court? Complete One Glass Mirror out of four is covered with the client’s branding. More Than 9.5 Lakhs is the Captive Audience Crowd which spends at least 1 hour sitting while having their meals. Hence, ZERO AD AVOIDANCE. These Glass mirrors are placed at the entry of food court which instantly catches the eyes of people visiting Food Court. Hence, Zero Ad avoidance. Dimensions 8 Ft.(H) x 5.8 Ft.(W)= 46.4 Sq. Ft. The availability of the inventory depends upon the time of booking. In case of damage of the vinyl on the Glass Mirror for whatsoever reason, the client would be intimated from our side. The new material costing in any case has to be borne by the client.